This was my first National Park Service Blackstone Valley walking tour. 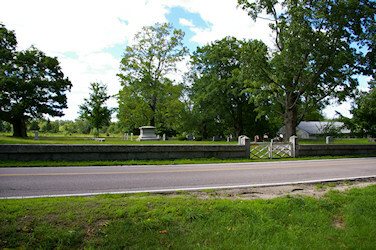 I've driven past all the Mendon sites hundreds of times over the years but have never stopped to look at them. There was no one else parked along Main street by Founders' Park so I parked my car right by the Mendon Historical Museum stairs, front row! Seeing that the museum wasn't open I proceeded on into the park. 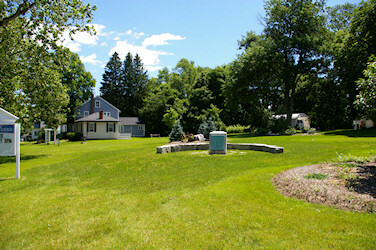 The 1930 Massachusetts Tercentenary Commission sign, Founders' monument and landscaping were all in very nice condition. Unfortunately the heritage corridor informational sign was missing all of its text and graphics. 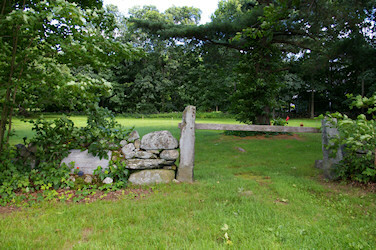 In the northwest corner of the park on the edge of Route 16 is the post road milestone. I was there at a bad time of day for seeing the mile stone, the high sun made the weather worn lettering very hard to read. 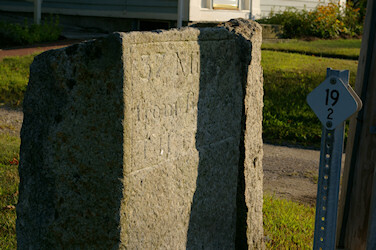 Driving by the mile stone on another day I noticed that the lettering was readable, "37 Miles from Boston". So I went back late in the afternoon on August 30th to take a new photograph. Unfortunately a nearby telephone pole casts a shadow right across the mile stone at this time of day. I'll have to go back there some morning to shoot a good photo. There is conflicting information about the date this mile stone was installed. I've seen dates of 1722, 1772, 1777 and 1785 cited by different sources. The NPS brochure states, "It was erected in 1772, during Benjamin Franklin's administration as Postmaster General for the Colonies." The date I've come across most often is 1772 so I suspect the occurrences of 1722 and 1777 are simply transcription errors of 1772. I'd normally believe the most commonly cited date of 1772 but, the physical evidence of the stone itself casts doubt on this dating. 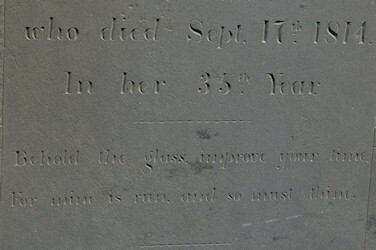 Although not readable in my photograph, according to this website and my memory, the third line reads "T. H. 1785.". 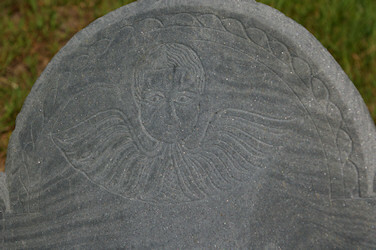 This indicates that someone with the initials T. H. commissioned this stone in 1785. Franklin's tenure as Postmaster General ended in 1775 so if the stones marking of 1785 is correct it was not erected during Franklins time in office. I'll have to check into this more to discover what the real story is. 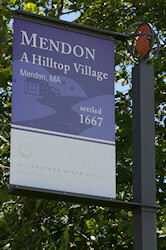 Just before leaving Founders' Park I noticed an error on the "Mendon, Hilltop Village" BRVNHC sign (see top of page). The BRVNHC sign says "Settled 1667" but the Founders' Monument has what I believe is the correct information. 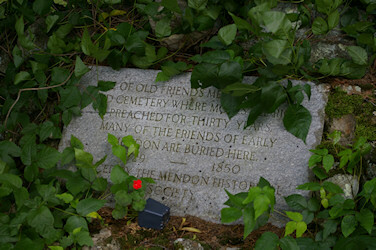 Mendon was settled in 1663 and incorporated in 1667, I guess someone mixed up the two when they had the BRVNHC sign made. Next up on the tour was the Ammidon Tavern directly across main street from the park. 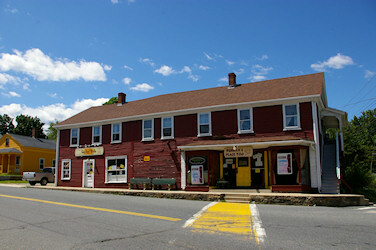 The tavern is well maintained and currently houses an antique shop. This tavern and the Middle Post Road mile stone are landmarks for the story of George Washington's trip through Mendon in 1789. Washington's diary says he passed through Mendon on October 6th 1789 and was refused lodging at the first tavern he came upon in Uxbridge. 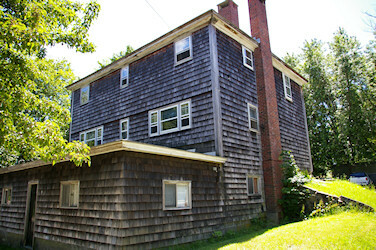 His party continued west on the Post Road finally obtaining lodging at the Taft Tavern in western Uxbridge. Based on the route described in Washington's diary it is clear they left Mendon via the Middle Post Road . 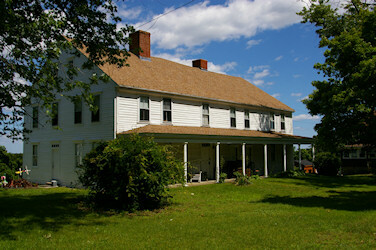 According to local legends Washington had stopped at the Ammidon tavern with the intention of staying the night. 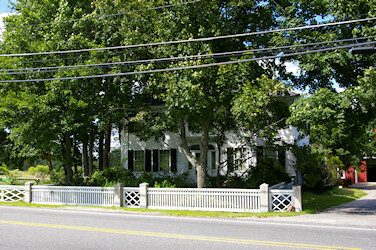 Colonel Phillip Ammidon owner of the tavern and possible acquaintance of the President was not at home. For some reason the President's party was turned away, the legends disagree on the reason. For more information about Col. Ammidon see here. 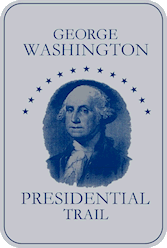 To commemorate the bicentennial of Washington's trip through the region the Massachusetts legislature created the George Washington Presidential Trail in 1989. 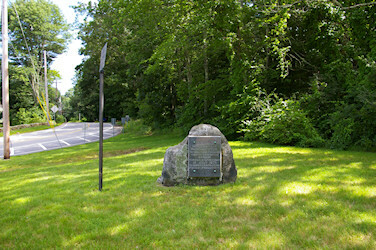 Signs were erected to mark the route of the Post Road between Founders' Park and the Taft Tavern in Uxbridge. Walking down Main street south of the park I saw the well preserved 19th century buildings mentioned in the tour brochure. 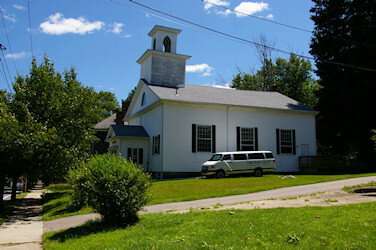 The former Congregational (now Baptist) Church, Adin Ballou's house, The Record Room and the 1830's commercial building. Heading up Maple Street I passed an interesting little house painted bright yellow. The next tour stop was the handsome 19th century Unitarian Church with its 130 foot tall steeple. 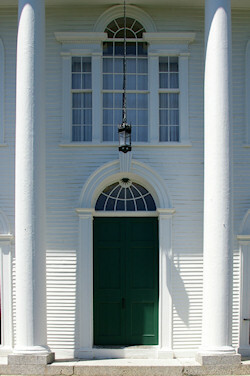 I enjoyed its beautiful architectural details including the Tuscan order columns, unique arched transom light and Palladian window above the front door. After the church I started my first extension of the tour by continuing up Maple street past the only waterway in downtown. 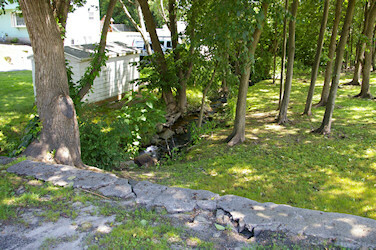 Willow Brook is contained in a man made channel north of Maple street but opens up to a more natural looking channel on the south side of the street. Flowing southeast it joins the Muddy Brook which continues on to join the Mill River. 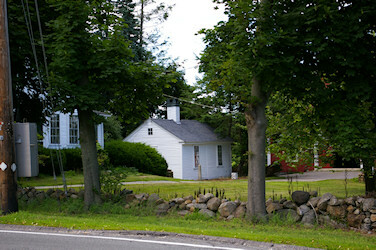 Walking up to the intersection with Route 16 I visited Mendon's Civil War monument. This carved black granite pillar honors the twenty men from Mendon who died in the Civil War. Heading back down Maple street towards downtown I was watched by a curious little resident as I passed by its territory. Rejoining the NPS tour path, I traveled back down Maple street to the intersection with Main street. Here I began my second tour extension. Crossing Maple street there is good view of Town Hall and a glimpse of the George House (0.1mile south on Main). Walking halfway across the Main street crosswalk I stopped at Memorial Square. It's a small triangle of land 50 feet by 15 feet with monuments honoring WWI, WWII, Korean & Vietnam War veterans. 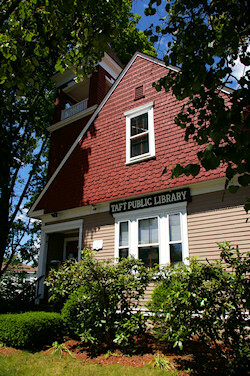 Returning to the crosswalk I finished crossing Main street for a close look at the circa 1896 Victorian style Taft Public Library. Walking back to the NPS tour path via the two crosswalks I headed back up Main street to my car. 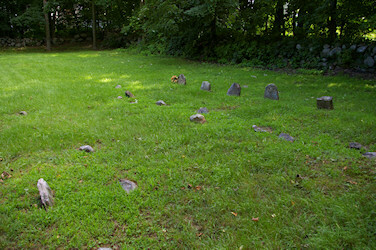 The next stop on the NPS tour is the Old Cemetery but, before entering the cemetery walk 350 feet north to the intersection of Main and Blackstone streets. Here I had a better view of the George House. The main house is mostly obscured by mature trees along main street but I had good views of the outbuildings on the estate. 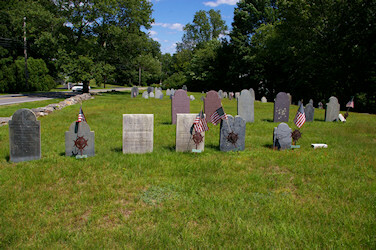 Before visiting the Old Cemetery I'd used Google Earth to see how much walking is needed to see all the gravestones. Knowing there was a half mile of exploring to do, I made sure I had an hour to spend here. Heading into the Old Cemetery my first stop was the towns' monument to the soldiers of the French & Indian and Revolutionary wars (left of flagpole). From here I took my time winding through the rows of graves towards the south end of the cemetery. The number of interesting gravestones and scenic views was outstanding. Before reaching the south end I'd already shot 50 photos. As of October this year visitors are going to see slightly different vistas. The large tree just outside the stone wall by the street was damaged in a storm and had to be removed. In my photograph below the tree is the one hiding the car and house from view. 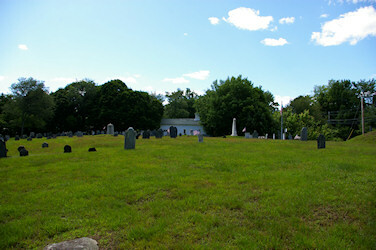 I explored most of the cemetery missing only the last few rows of graves at the south end. I had to skip that section because of a large black dog. The dog jumped the wall into the cemetery from the adjacent property and forced me to leave. Walking back north through the cemetery a woodchuck ducked into his burrow thirty feet in front of me. I spent a couple minutes trying to get closer for a good picture. The woodchuck popped his head up a few times checking me out but before I could get close enough he retreated down his burrow. 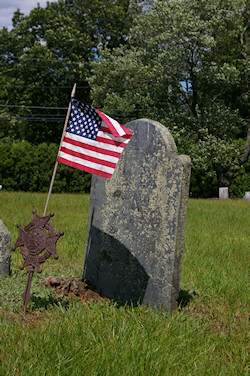 Turning back to the gravestones, right there was the grave of Col. Philip Ammidon, tavern owner and Revolutionary War Soldier (photo right). The diversity of 18th and 19th century funerary art and epitaphs found here is excellent. Below are two of my favorite photos from the dozens I took. Thomas Rawson's grave has a winged cherub head I found delightful and Cynthia Penniman's epitaph was intriguing. For mine is run, and so must thine." 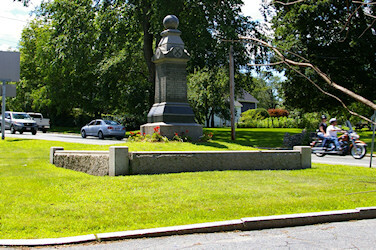 Before finishing the NPS tour, I took a side trip south on Main street to check out the King Philip's War memorial. Whether this was the beginning of the war in Massachusetts is debatable. Swansea was attacked June 20th however that action may not have been approved by King Philip. The Swansea attack lead to the first military response by the colony June 28th but that was in Rhode Island. Then Middleborough and Dartmouth were attacked July 8th however no one died. While it may not have been the beginning of the war in Massachusetts, it is was certainly the beginning of the war for the Nipmuc people and the Blackstone Valley colonists. Returning to the tour I parked at the Friends Cemetery on George street. 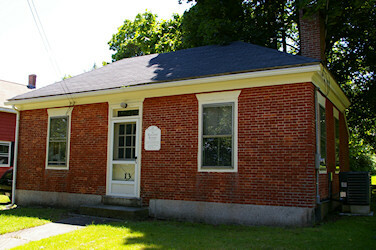 The Mendon Friends Meeting House was located here but all that is left now is the cemetery. To the left of the entrance I saw the historical society memorial with a potted flower that had fallen over. I was going to stand up the flower and move away the wild plants obscuring the memorial for a better photo. That's when I realized the wild plants were poison ivy and kept my hands away. This is one of the very few plant hazards in the Blackstone Valley, learn to recognize it to avoid an irritating rash, leaflets three let it be. 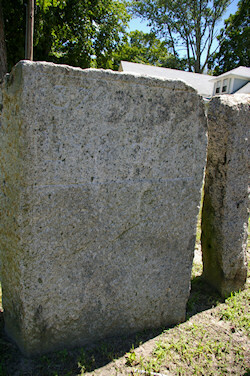 The oldest grave markers here are simple upright fieldstones from the early 18th century. Later gravestones are flat monuments that maintain the simple open appearance of this fine old cemetery. I didn't enter the George Cemetery across the street because I was afraid the gates would break if I tried to open them. 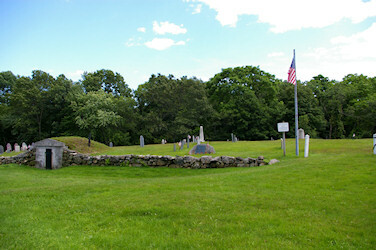 This classic New England family cemetery was easily seen from outside the wall so entering didn't seem necessary. This was the last stop on the NPS tour but there was one other site mentioned in the brochure left to check out. 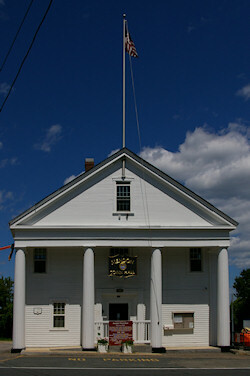 Lake Nipmuc Park is about a mile and a half west of downtown on Route 16. I drove out with the hope of seeing the remains of the old park. Unfortunately there is no public access to the old park and after driving all around the lake I could find no public access or good viewing spot. There are two other unique places in Mendon that I learned of when reading the Natural Resources Inventory and Assessment, Listing of Valley Sites and the Heritage Landscape Inventory, Mendon Reconnaissance Report. The first is the Lake Nipmuc Rookery, "the second largest great blue heron rookery in Massachusetts, with between 60 and 70 nests. There is no protection for the rookery, which is on private land". I drove all around the area where the rookery is located but as I suspected there are no viewing or access areas. 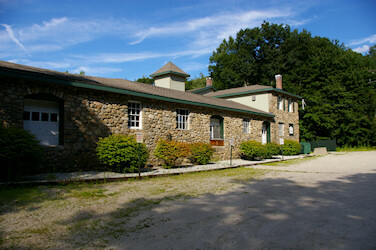 The other place is Miscoe Springs, "This 100 year old natural spring is an old bottling business with a rich history. It is an excellent candidate for interpretive activities, but is threatened by over development." I went to check out the Miscoe Springs bottling plant on a Sunday later in the month. 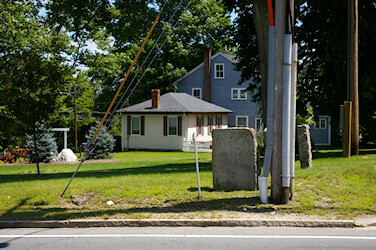 I found it to be an interesting field stone building on a beautiful stretch of Northbridge road. 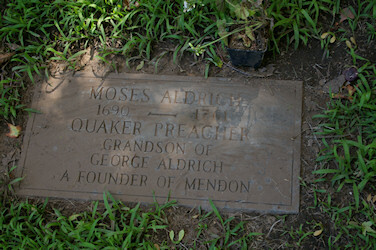 This business was originally owned by the George family whose home and cemetery are part of the walking tour. Miscoe Springs Inc was sold to Garelick Farms in the 1980's which was then acquired by Suiza Foods Corporation's (1997) who in turn bought Dean Foods in 2001. 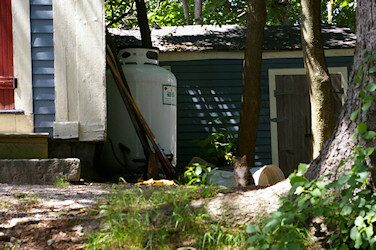 Miscoe bottles Acadia spring water which is sold by Stop & Shop. It was tested as part of this Boston Globe article; "Water wars: In the final analysis, the price is all that separates them". 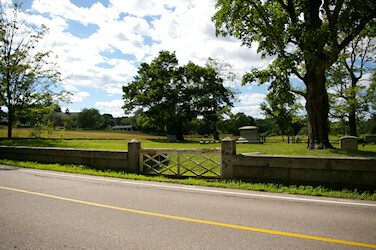 I enjoyed my tour of Mendon, it is a pretty hilltop village with a long history. Someday I will get back there when the museum is open to see their collections, get a better photo of the mile stone and see the part of the Old Cemetery the dog kept me away from. There are also many outlying scenic vistas, farms and roads listed in the Mendon Reconnaissance Report that I hope to visit over the coming years. Here's hoping the town can keep its charming character intact in the 21st century. 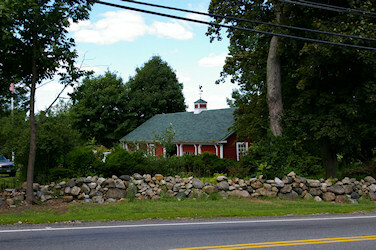 Mendon Driving Range & Miniature Golf, Route 16 1/2 mile west of downtown. Mendon Twin Drive-In, Route 16 1/2 mile east of downtown, Seasonal. George's Surf & Turf, an authentic drive-in restaurant, Route 16 1-3/4 miles west of downtown, check their web site for opening and closing dates.